Safety high tempered glass surface easy to clean, lightweight and portable. 4 high precision sensors to support accurate weigh measuring from .1 oz. to 11 lbs. (1 g to 5 kgs). Sophisticated TARE function, one touch and automatically zero out weight, subtracts the weight of any bowl or container and get net weight of your ingredients. Auto turn off in 60 Seconds. Powered by 1xCR2032 lithium battery (included), 100% product and shopping satisfaction guaranteed. Make measuring and clean up as easy as possible in your kitchen with the Surpahs Touch Ultra-Thin Tempered Glass Digital Kitchen Food Scale. This stylish and elegant scale featured a large LCD screen and a tempered glass design that cleans up quickly. 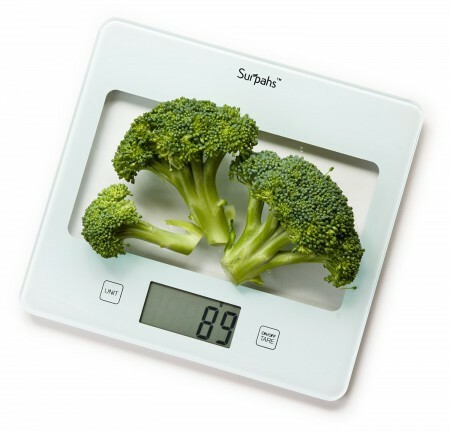 With this lightweight and portable scale, you can measure food at home, at work, or while traveling, allowing you to stay fit anywhere. Screen: LCD, 56×25.5 mm /2.2x1 inches.